Last night was the summer solstice which was a chance for me to spend some quality time in the garden working on building up the rows for this planting season. 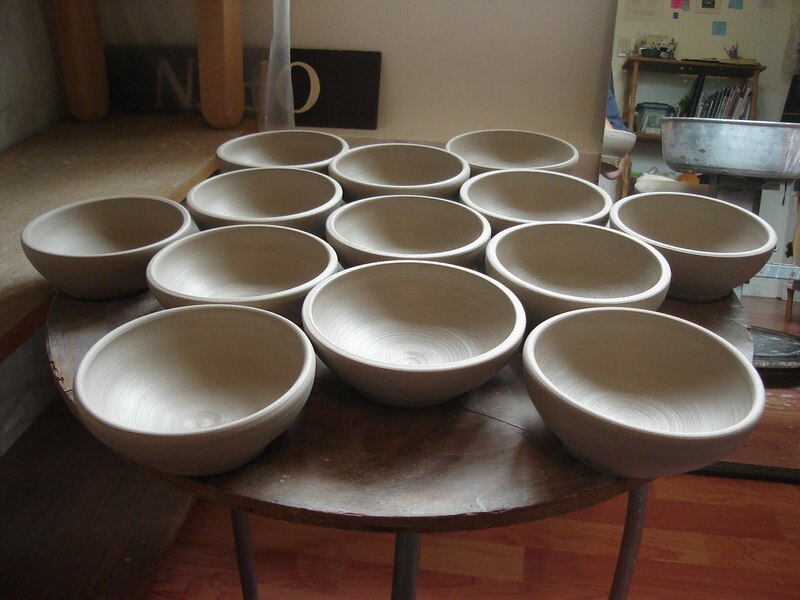 I threw the bowls that I had prepared the clay for and then escaped the studio for the garden at 6pm. The most glorious evening started with such a lather that the black jogging visor I was wearing slurped up enough sweat to create a white salt accumulation!! I worked up soil until 10pm and wouldn't quit until the rows were finished. I put some plastic sheets over the peas that are always a very tasty snack for the apparently ravenous local birds and used unbreakable clumps of clay (i mean that i wailed away on them with the sharp end of my hoe for a while and then gave up) to stabilize the sides of the built up rows. The clay (very funny i know) clumps hold water well and help the soil from being washed away into the walking lane. At 10pm when I finally couldn't see to walk around any more, I sat down and listened to the neighbourhood. When evening shift dave came home, I was scraping and scrubbing my soil blackened feet and feeling very happy at my effort. Today brought a warm wind and sunny skies to greet the new season and such a combination tends to dry my fresh pots quickly so I am off to trim them now. The Markets (Duncan Farmers' Market & Sidney Evening Market) are running along well and we had yet another new vendor adjudication monday that went really smoothly with a lot of quality vendors wanting in. As a conclusion of sorts, the two spare rooms (race dave's dirty room and my guest/knitting/sewing room) were completed on time as the folks were walking through the door who had to then help with the construction mess and cutting dust that blanketed everything. I will put up a photo or two of the new rooms once I catch up with some chores that have piled up. Any local potters who might read this blog, I am going to the supply shop early next week and could take someone or bring something back for you, email me if you'd like to partake.